Beaver County Transit Authority is a major player in the economic development of Beaver County. Their outdated website was impeding their ability to easily communicate to riders, and was not allowing potential riders an easy way to learn about riding the bus. 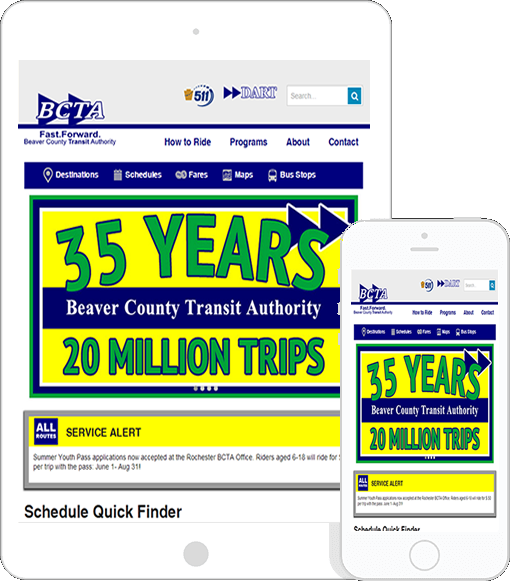 Pacer worked with the IT and Marketing departments at BCTA to develop a new website that is completely responsive and allows visitors easy access to information. The website renders wonderfully on a desktop, a phone or tablet device. The new website renders to fit every screen. Visitors now get a proper experience, regardless of the device they use to visit the site. We re-evaluated all the data that was displayed on the previous site, and designed everything with the user experience in mind. With analytics in hand, Pacer was able to devote more development time to the areas of the site that garnered the most usage. We wrote the script, cast the talent and produced the entire video. User response has been outstanding, with a 37% longer time spent on the site. BCTA wanted a new, fresh and functional site. 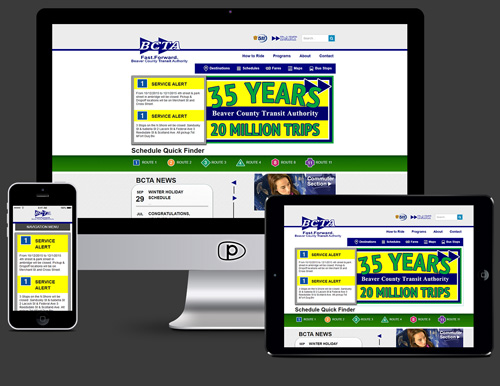 They wanted a site that would help promote their commuter experience, as well as a site that allowed them quickly communicate delays, closing and other news to their visitors. Take a look at the site yourself, and see the results that Pacer delivers.